← Tortoise raging is my life – slow progress. It’s a combination I would have never considered. Turns out it’s fantastic. My dad sent me this lovely article “The Secrets of Jamie Oliver’s Chicken and Milk” and I had to make ASAP. I actually followed the chicken recipe. My personal additions were the potatoes and matching veggies. It will now reside in our family canon of comfort foods. The essential flavors prepped. So simple. So beautiful. I’ll share what I did, but this isn’t the recipe. First I liberally covered the whole chicken in salt and pepper and fried it in butter and olive oil. Then I removed the chicken and some of the oil and fried the garlic and cinnamon stick. The recipe said to keep the garlic in their skins and I only did that with some of them and I really would take all the skins off next time. Then I added the milk, lemon peel and fresh sage. Then the chicken and potatoes. The whole thing went in the oven. The potatoes got done cooking before the chicken was fully done so I had to take them out early. I’ll fiddle with the potato plan in the future. My veggie side turned out fantastic but I wasn’t expecting it to so there aren’t any process pictures. In a little oil I fried some red onion (just because I had it and it was getting old), salt, black pepper, cinnamon powder. I then added chopped broccoli and cauliflower along with the juice of the lemons that I had pealed for the chicken. I also happened to have some dried sage and added a bit of it. Let it fry until the vegetables were cooked and the liquids were mostly evaporated. 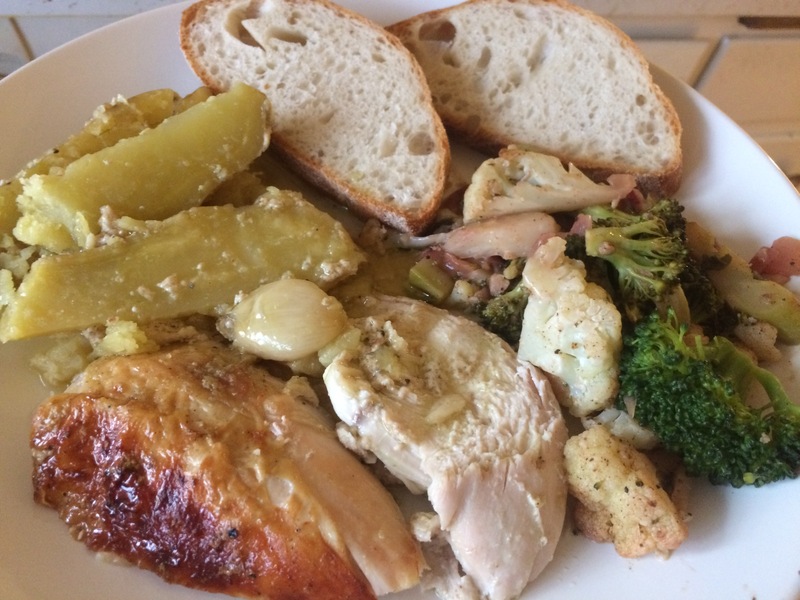 This entry was posted in Kym Cooked and tagged chicken, comfort food, Jamie Oliver, NYTimes Cooking. Bookmark the permalink. I refer to NYTimes Cooking often; and just now saved Oliver’s recipe to my recipe box. Your prep and tweeks look delicious. Thank you for this hugge meal post.